I was again left to my own devices for most of the OC but this time I had a car. Though I did try to go for a walk and again people looked at me like I was insane. Anyway, the OC actually has some really tasty food. Read on to find out what I found to eat in 24 hours in the OC. 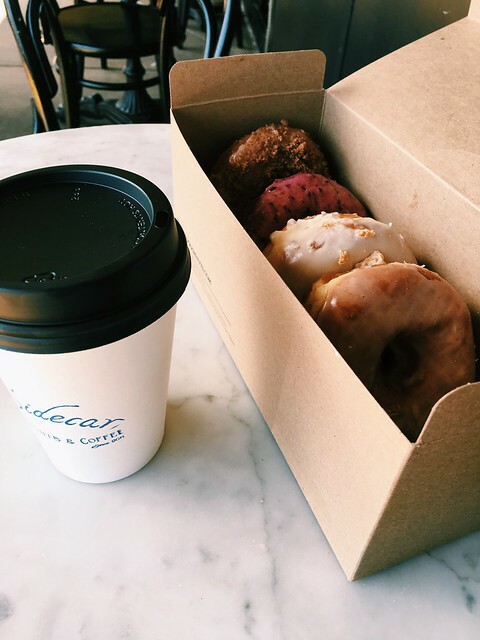 The breakfast of champions can be had at Sidecar Doughnuts. Seriously the donuts here are really awesome. I couldn’t pick just one to eat so I got four (huckleberry, meyer lemon, almond crunch, and cinnamon). Lest you think I’m a total glutton; I only ate a quarter of each and saved the rest for my hard at work friends.